If any of the programs in the Microsoft Office suite are crashing or not working right, here’s a tip that might help you. Almost all versions of Microsoft Office have a repair feature… but it’s not easy to find unless you know it’s there and you know where to look. Now you’re going to know it’s there, and you’re going to know where to look, because we’re going to show you. First, go to Control Panel > Programs and Features > Uninstall a Program. If you’re using Windows 10 version 1703 (Creators Update), Control Panel isn’t easy to find. You can open Control Panel by using Windows Key + R to open a run box. Type Control in the run box and press Enter. Control Panel will open. When you click on Change, you’ll see your repair options. Note: Yours may look very different than this if you’re using a different or older version of Microsoft Office. Chose one of the repair options, then click on “Repair”. 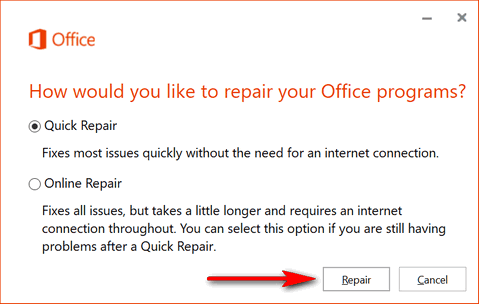 If you’re using a different version of Microsoft Office your repair options may be different than mine. But you will have at least one repair option. And if any of your Microsoft Office programs are not working as they should, you will certainly want to give the repair option a try. I have Oracle’s Open Office installed on my PC does it have a similar repair feature? thank you for all those good helping tips you provide. I don’t know, Ken. I don’t have it installed. I would suggest you go to control panel / programs & features and highlight Open Office and see if it gives an option to change as well as uninstall. If you see an option to change, click it… it may be a repair option. This fix worked perfectly on my Office. Excel and Word both were hanging on initial startup and now they work great. Thanks for the tip. I found lots of items listed Microsoft Corporation., but no listing of Microsoft Office? I tried the quick fix and it did not work. Went to the one that used the internet and it not only did not work but it deleted my Office program. Now I can’t get it back. I lost the original download and my 2013 license code will not work when I try to get a new copy from Microsoft. I tried to do a system restore but Office would still not work. I have emails saved in trip folders in my Outlook program that I need. I do have both PST and OST files saved but no program and I really don’t have enough free funds to buy a new version. Where are my antacid tablets? You need to contact Microsoft. Obviously this is not something that should happen. Darcy & I have used both repair functions and never had a problem. We’ve also used the repair on other computers and sometimes it didn’t work, but it sure doesn’t uninstall office. You can download Microsoft Office and you can call Microsoft and explain what happened. You’d be surprised at how accommodating they are. They will give you a product key if you can show you had one previously.